The Attitude Era is quite possibly the best time to have been a fan of WWE. With the very serious threat opposed by Ted Turner's WCW, WWE needed to change how they did business and what was happening on WWE programming, and boy did they! Gone were the cheesy gimmicks and overly large superstars big pushed. WWE's new TV-14 rating allowed for more visually shocking matches, moments, superstars and of course, feuds. The Attitude Era brought us arguably the best WWE storylines of all time. I mean sure, it wasn't perfect, for every Rock vs. Stone Cold, we had Mark Henry vs. Viscera, but the positives always outweighed the negatives. 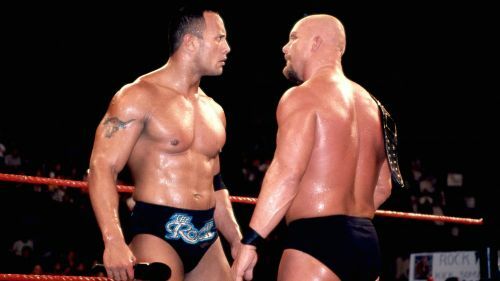 With so many incredible feuds and storylines having taken place in the Attitude Era, I have decided to take a look back over what I feel are the top 10 best WWE feuds of the Attitude Era. While the Attitude Era officially started in December 1997, It is hard to say when the Era exactly came to an end as many consider it to have when Steve Austin turned heel at WrestleMania X-7, but WWE themselves consider it more so to be around May 2002, when the WWF officially became the WWE. And so with that in mind, all feuds I will be focusing on will have to have happened between December 1997 - May 2002. 'Brother' vs. 'Brother'... Oh, brother! The rivalry between The Undertaker and Kane is like something right out of a comic book. Despite how far fetched and often cheesy that it was for TV, it still worked well in WWE's direction of where they wanted to take their programming and audience. Their 'father' Paul Bearer had revealed that Kane had survived the fire that killed The Undertaker's family, and was coming for revenge on his 'brother'. Kane debuted at In Your House: Badd Blood in 1997, costing The Undertaker the very first Hell in A Cell match to Shawn Michaels. 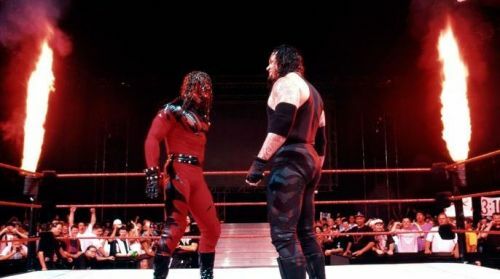 For weeks, Kane would try goad The Undertaker into attacking him, but the Deadman refused to lay a hand on his brother. Kane all of a sudden started to aid Taker from his three on one assaults from D-Generation X, but would quickly turn on him once again at the Royal Rumble, this time costing him a WWE Championship Casket match with Shawn Michaels. Kane then set the casket ablaze, but Taker managed to escape. The two played mind games with each other until their match at WrestleMania XIV, which Taker won. They continued to feud until Unforgiven the following month, when Taker once again defeated Kane, this time in an Inferno match. The Undertaker and Kane would close and reopen their feud several more times, often adding in other superstars as apart of multi-person matches, such as Stone Cold Steve Austin, Big Show and X Pac. They would also briefly feud in 2000 while The Undertaker was the American Badass, culminating in a one-on-one match at SummerSlam that year, and some multi-person WWE Championship matches. They later officially formed the Brothers of Destruction tag team in 2001. The Undertaker and Kane worked so well as enemies that they would also feud post-Attitude Era as well, in 2004 and 2010.